The earthy, tangy, nutty flavors of this salad are very satisfying. I played with this a bit - roasting the broccoli instead of steaming and using pistachios instead of walnuts. That said I am sure this would also be excellent with walnuts and when I have them on hand I will certainly make it as written. The yogurt dressing is delicious and gives the salad great zing! This was an interesting way to use broccoli. 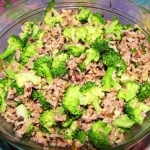 I used Lundberg wild and brown rice mixture for this and loved the variety of rice. I didn’t have a red pepper, but the sweetness would have added a nice antidote to the overpowering acidic flavor of this dish. I don’t have walnut oil, so used olive oil and added extra walnuts. It was very good especially since I used no salt at all.